Metals in soils may positively or negatively affect plants as well as soil micro-organisms and mesofauna, depending on their abundance and bioavailability. Atmospheric deposition and biological uplift commonly result in metal enrichment in surface soils, but the relative importance of these processes is not always resolved. Here, we used an integrated approach to study the cycling of phosphorus and a suite of metals from the soil to the canopy (and back) in a temperate watershed. The behavior of elements in these surface soils fell into three categories. First, Al, Fe, V, Co, and Cr showed little to no enrichment in the top soil layers, and their concentrations were determined primarily by soil production fluxes with little influence of either atmospheric inputs or biological activity. Second, P, Cu, Zn and Cd were moderately enriched in surface soils due to a combination of atmospheric deposition and biological uplift. Among the metals we studied, Cu, Zn and Cd concentrations in surface soils were the most sensitive to changes in atmospheric deposition fluxes. 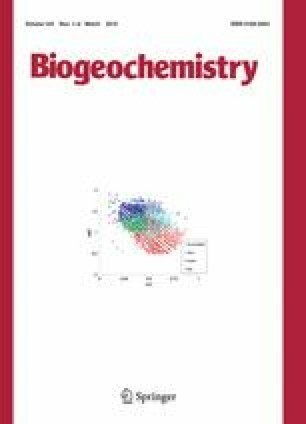 Finally, Mo and Mn showed strong enrichment in the top soil layer that could not be explained strictly by either current atmospheric deposition or biological recycling processes, but may reflect both their unique chemistry and remnants of past anthropogenic fluxes. Mn has a long residence time in the soil partly due to intense biological uplift that retains Mn in the top soil layer. Mo, in spite of the high solubility of molybdate, remains in the soil because of strong binding to natural organic matter. This study demonstrates the need to consider simultaneously the vegetation and the soils to understand elemental distribution within soil profiles as well as cycling within watersheds. The online version of this article (doi: 10.1007/s10533-015-0068-5) contains supplementary material, which is available to authorized users. This study was supported by National Science Foundation (NSF) Grant GG-1024553. A. Dere received additional support from NSF GK-12: CarbonEARTH Grant EHR-0947962. The authors acknowledge K. Gaines, J. Wubbels, L. Smith and J. Kissel for green leaf and leaf litter collection and chemical analysis. We also acknowledge the Fall 2009 GEOSC 413 class at Penn State for their work collecting and analyzing samples at the SSHO as well as W. Castro, H. Gong, L. Liermann and J. Williams for analytical assistance. This work was facilitated by NSF Critical Zone Observatory program Grants to CJD (EAR 07-25019) and SLB (EAR 12-39285, EAR 13-31726). This research was conducted in Penn State’s Stone Valley Forest, which is supported and managed by the Penn State’s Forestland Management Office in the College of Agricultural Sciences.